jqGrid – jqGrid 3.5 ALFA 3. The source code of the demonstration can be downloaded here. Please take note of the properties in the dialog. If you do not use the dialog('open') method separately to open the dialog box, the dialog box will open but only for the first time. Subsequent selection of rows will have no response. To mitigate this, we declared the dialog with autoOpen as false and open the dialog box separately using dialog('open'). Now go ahead and run the application for gratification. This is what shows up: There many methods attached to the Dialog Box. We can make this as an editable form of the data in the grid row and have buttons on the dialog box making Ajax call to execute CRUD operation. Also, pagination can be added to it in order to move from one row details to the next or previous one. 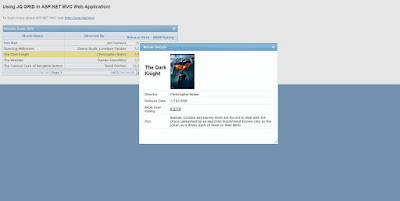 That will actually complete the DetailsView data control using jQuery. You may explore the exposed methods here. Thanks.is there anyway to display the image in the grid itself? this is excellent example. thanks for posting the source code as well . .
@firehose911 – I haven’t tried but I’m sure you will be able to do that. Try adding a column in the grid for the image. From the code behind, for the value of that column, send an image tag with values set. I think it will work, however the image size will have to be managed. Se possibile grazie merluzzo fonte download di questo exaple?